Ever since that incredible Capital One Cup Game against Arsenal, I’ve been tackled by disgruntled Royals supporters complaining about the referee’s timekeeping. I’m sure no one will need reminding that Reading squandered a four goal league, with the Arsenal equaliser coming in the dying seconds of the second half, leading to extra time. It wasn’t so much that the referee had allowed an extra four minutes for time lost that upset the Royals fans but that he seemed to stretch the game beyond those four minutes, giving Arsenal time to score. The Laws of the Game give the role of timekeeper to the referee and the referee alone. It would seem a simple enough task, the referee looks at his watch, it says forty five minutes is up and he blows his whistle. If it’s that simple why is it so often contentious? We talk about added time but the Law calls it is ‘allowance for lost time’. The referee doesn’t wait until he gets to the forty five minutes and then try and add up all the time lost through stoppages. He simply stops his watch when the stoppage occurs. The stoppages may be substitutions, injuries, time wasting and other situations that prevent play continuing. In professional football, the referee indicates to his fourth official, just before the ninety minutes is up, that the two watches he wears, one he stops and one he doesn’t, show a difference of say four minutes. At the end of the ninety minutes the fourth official shows this on the electronic board and the announcer gives this out over the public address system. The announcers are instructed to say, ‘a minimum of four (or however many is shown) minutes,’ and here is the first clue as to why the game could be extended past the period shown. The referee’s watches may show that there are four and half minutes to play but he rounds this down to four minutes for the fourth official. So, unlike what the television commentators seem to believe, he is not necessarily going to blow for time at the end of the minute, it may justifiable go on a little longer. Incidentally, I guess that most of the supporters who tackled me on this subject were watching on television rather than being at the match itself. I say this because the clock at the stadium does not carry on after the ninety minutes whereas on television they do and I doubt whether many, if any, supporters check the timing on their watch. You can tell this from the whistles that go up long before even the stated added time is competed. There are two other reasons why his actual whistle may not coincide exactly with the time shown on the board. 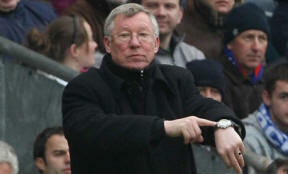 The referee informs the fourth official of what his watches show, a little before the end of the ninety minutes. This is to allow him time to set up the board etc but it does mean that more stoppages may occur during this period for which time has to be allowed but of course there is no further announcement. Secondly, there may be stoppages during the added-on time itself, which further extends that period. One example is substitutions. Can anyone tell me what managers expect to gain by bringing a substitute on with only a minute remaining of added-on time? Unless, of course, they hope the referee will not add on more time for it, so they have wasted valuable seconds.. Then there is time wasting. You will often see the referee indicating to a goalkeeper who delays taking a goal kick or a player taking his time over a throw-in, that he is not gaining anything as he has stopped his watch. I think it’s easy to see why those minutes may have stretched.